"You loved your Tau army." James said one evening, completely out of the blue. It turns out that James had been seriously considering starting a Necrons army. But, he was torn over the morality of it all. Grey Knights had unleashed some serious cheese upon the game and having been penned by Matt Ward, the Necrons looked set to be the same. But of course, James being James, he couldn't bring himself to play an army just for the sake of winning. He has to be enthralled in the story of the army. That's why he stuck with his Thousand Sons through thick and thin. That's why he always held an inane belief that his Space Marines were somehow so much better than other Space Marines, which still baffles me to this day. This is also why he sold his Eldar army a while back, because he just didn't get engrossed in their story or relate to any of the characters. James continued telling me how I should never have sold my army and moved on to play other races, explaining "You liked playing them so much, that you didn't even care about 'being competitive' or if you lost." And he's quite right. Although I spent a lot of time developing my own army list and a style of play that worked well for me rather than mimicking the tournament meta lists on the internet. So the competitive element was there. I wrote a really great post on why I love playing Tau a while back and in hindsight I should have stuck with the army for these reasons. But only now that I'm tired of driving metal boxes across the board in a straight line, as fast as I can, and that I'm tired of ultra competitive 40K, have I realised my love for the hobby and what it means to create a completely unique army for yourself. I met James at the cafe for breakfast on Saturday. He was already there when I arrived; coffee in one hand, the new Necron Codex in the other and a greasy fried breakfast on the way. "This is horrible!" he joyfully exclaimed as I sat down...and began reading all manner of nonsensical stuff from the new Necron Codex. "So you're going to do Necrons?" I asked, feeling rather scornful at the sheer volume of disgusting rules he was reading out. "I'm not sure," he answered. "I can't figure out a list yet and I want something that's characterful rather than just being all out competitive." After a hearty fully English breakfast and a wander round Harlow town, we dropped into the local hobby shop so I could pick up a Warmachine starter box and took a look at the new Necron releases. I think that we often need to see beyond what Games Workshop provide us with as the basis for an army. Some how we need to add our own inspirations and make an army our own. 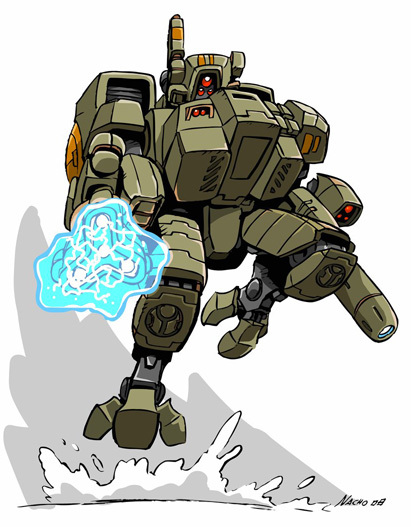 By including elements from years of playing Turrican, watching Transformers and various mecha anime shows, plus a little feudal Japan history and a Russian inspired military colour scheme (with orange stripes!) I got my Tau army -and they were brilliant! What will James' Necrons be like? No doubt evil and maniacal if they're going to be led by Overlord Skeletor! I don't know about you guys, but I can't wait to see what he comes up with. But most importantly, he needs to love building, painting and playing his army. Then it doesn't matter if you win or lose, because you're enjoying the game and the story of a game -And that's what this hobby is really all about! In the meantime, I'm getting some funky urban bases for my first batch of Tau Fire Warriors. Then I'll be continuing with my original Tau colour scheme of military green with orange stripes. It's just one of the many things I loved about my Tau army. I know you're perhaps not going to like this. But before Grey Knights, the Space Wolves were and still are the cheesiest of cheese too. I was sad to see you stop playing Tau and go over the Marines. Heck it was your blog that helped me decide on Tau and then also start my own blog. I took a beating from well experienced players at my local club and all interest in Tau disappeared. I won something like 2 out of 14 games and drew 2. I always said I never wanted to play with a a half painted or unpainted army as I knew where that would leave me... Right where I am now with a cupboard full of models I can't be arsed to finish off. I still check my site daily. Atm I have some Tau models out on my dining table as I was trying to visualize how to do a new scheme I want on the Crisis Suits. I want to get back into Tau really bad but something just isn't sitting right with me and 40k and it's bugging the hell out of me. I completely agree with you. There is something that has to grab me in the Fluff and look of an Army to buy them. I made the mistake of picking up Space Marines because "they win at everything" mentality after I bought Tau and realized they didn't do so well on the table top. Six months down the road and I shelved my Space Marines as I had a disgust in my mouth that I dropped my first love, for a team that would just win. I hated the overall static pose's that Marines have. Stick with the Greater Good. Your tau was some of the best around. Not to mention the fact that you painted yours the same green as mine, which I love. ( minus the orange) Try to get a Cadre going alongside James Necrons to play against. ahah "you loved your Tau army", that made me think of some bad line from a bad romantic movie : P.
I am glad you are on your way back to the Tau, i too always try to enjoy the game my own way,do not only aim for victory ( well yes we do try to win the game ) but what we must keep in mind is the fun we have! a bunch of mofos, a table, a war going on and some funky subject to spice up the lot. just found this site. and have to say. loving it!!!!!! i got out of tau about a year ago, and have been missing it for the last few months. and i agree with the adding things to "your" army. i only had one guy to play with when i started playing, and i would go back to my commander after every battle we did and add things. like scars and missing bits to add character. like the battle he got carried off the field in the back of a devilfish because he was hit in the back with an ork rokit. i cut up the back of the model to look like damage then repainted the aria. I'm regretting selling my models now. I am under the opinion that if you don't look down on the table and tell yourself, "I really love my army" then you are playing the wrong one. Thanks so much for this delightful post. I love my army (Orks). I started playing Eldar in version 2 with my young sons. Then GW did away with most of the psychic powers I loved so much and I switched to Space Wolves because I find wolves fascinating creatures. After one particular game my youngest son pointed out that I keep playing SW as if they were Orks. Ah hah! I switched to Orks and have not been disappointed. Orks are demented! The way I construct and play my army is fluff driven (I almost never win). I almost always play some random character (Big Mek with Shokk Attack gun or Warp Head), which as my wife has pointed out means if I win it is an accident (even though I always play to win). Playing a snazzy tourney army designed simply to win just presents no interest for me. I have to have a strong back-story for my Boyz. As you wrote, ". . .that's what this hobby is all about!" Thanks again. Today there was supose to have a game Orks Vs Necrons (proxied to try out the new codex) where i usually play with a bunch of chaps. My friend wanted to humiliated this (abusive we can't hide it) codex, beat it hard. So he made a very cheesy and cheap Ork army. But in the end, the guy suposed to play Necron never showed up, so we ended up with nothing. After a few hours i decided to play a game against another guy against whom usually play against (and win) he plays IG. So we went on playing and well ... i gotta say that the Valkieries Vandettas just won him the game it was just no fun.... it just scout move, get clsoe enought to fire 3 twinlink lascanon inside the DP range and blow my tanks right before dropping a bunch of veterans with plasma or melta. All of this to say: i lost faith in the game ... right before today i was still confident that it could still be good... but after seeing, cheap units in an army, rage to win against another army and hear more and more stuff about the broken Necrons or Grey Knights. Everything seems like a big joke, the game dosen't have love anymore. I just look down at my army i built with love, experienced stuff, had experience with, being wiped with the back of the hand by someone who dosen't have a clue of what to do or just use some cheap stuff or whatever.... even the fluff get rewritten to a point it's stupid, armies get stuff they shouldn't that drive them from their initial concept. after what i saw today, i just feel like selling my stuff and start somewhere else, like warmachine. Can anyone still conveince me of staying? i still love my army and it,s play style. I just feel like it's pointless to continue, others in my group felt the same thing and think about jumping in the warmachine boat before GW's goes down. I know what you mean Anucer, it can be annoying to get slapped about by an army that looks like it was salvaged from the bin. This is why touraments with 'soft scores' for painting and such are coming back -to reward people who put love and care into their armies. Yes, any moron can win with Grey Knights as you amptly point out. But what about when the new Tau Codex comes out? What about when 6th edition comes out? As I've said before, strategy will always in out over brute force. We just need to hang in there a little while for 'strategy' to get a boost. In the meantime, go pick up a Warmachine boxed set. I did and it's been great fun and a refreshing change. But I'll always come back to 40K. It's the game that everybody plays! oh well i guess i'll keep my army just in case but right now it's hard to get the motivation to keep painting it. GW's seems like making cash trip by bringing the prices up and trying to sell us stuff quick with some cheap codex like if they were going to vanish soon. Plus the game dosen't feel like getting much love anymore, it also get away from it's fluff and it seems to promote power gaming rather than having fun with friends. ugn anyways i guess i need to stay away from this game for a while and check what happen, i'll do like you said and go pick up a cygnar starter box with a few things and enjoy it. This game seems like being much more about fun( even the rule book state it! ) than anything else, with all the fluff around and the combos and magic power and everything! i'll give it a shot! And your 'why I play Tau' article link is very good. I think Tau fit 80s babies like us to a tee. Robotech and Battletech were compulsory watching for me as a lad, as well as He-man and the Wuzzles, lol. I just watched Samurai Champloo, and was delighted at the animation and cool story. The story is in fuedal Japan. I think your point about Tau also applies to the Retribution of Scyrah faction in WM. Because they are not like the jacks from Khador, Cygnar and Menoth, people think they are weird. Which is somewhat how Tau suffer in 40K - not being all slab sided like Imperial gear. I see the RoS as somewhat of a blend of Tau into a Fantasy setting. They have knight-samurai (Dawnguard), standing army-Ashigaru (houseguard) ninjas (Mage Hunters) and then battlesuits that are Tau/Invid like (Myrmidons). All with that crisp white glow. Yum! Anyway. Yeah, if you don't like the fluff but play the army anyway, which I suppose could be called band wagoning, then you are missing out on the full picture about 40K. I am interested to see your interests change from being very competitive with your SW, to wanting to be a bit more chilled out about your hobbying. Or even if you are playing hard, it is still using an army you love, over one that is simply strong but you don't "love" it. I also think that is part of the danger of using a strong Dex like C:SW. You feel that you have to take the strong units, all the time. Did James even use C:SM for his DA? If you don't "love" your army, you need to play something else. What Should I Buy for Tau Now?